As a teenager, I didn’t know how to revise. Nobody taught us back in those days. In fact, what I did was the exact opposite of what kids are taught today. I re-wrote my notes once. And then I read them. Endlessly. I would revise for hours on end – up to nine hours a day in three hour blocks as I approached my GCSEs or A Levels. Strangely, it worked for me and I came out with excellent results. But these days, schools don’t leave such things to chance. My son is in year 7 at a very good grammar school and has his year 7 exams coming up. Parents and kids have been told that it’s very important not to stress or overdo it, but the school has also been very clear about how they should revise. The kids have had lessons on revision technique from both teachers and year 11s. The year 11s were happy that they’d been taught how to revise in year 7 because they’ve carried that through the school with them, refined it and found what works for them. So they go into their GCSEs knowing exactly the best way to revise. I don’t want to get into the whole debate about how much is ‘too much’ in terms of revision and exams for kids of different ages but, to me, that sounds like a really good thing. My eldest is in year 10 at a comprehensive. He’s just done very well in his year 10 exams. He also had exams in years 7, 8 and 9. He never revised for them and I never even knew when the exams were, thanks to poor communication from both the school and him. Maybe there was a letter that he ‘forgot’ to give me or which went through the wash with everything else?! But there was never an email. Why not? My younger son’s school has sent us advice on revision, a suggested revision timetable and revision tips and subject areas to study for each of their subjects. They’ve told us to ensure our tweens have peace, quiet, space and light to revise. 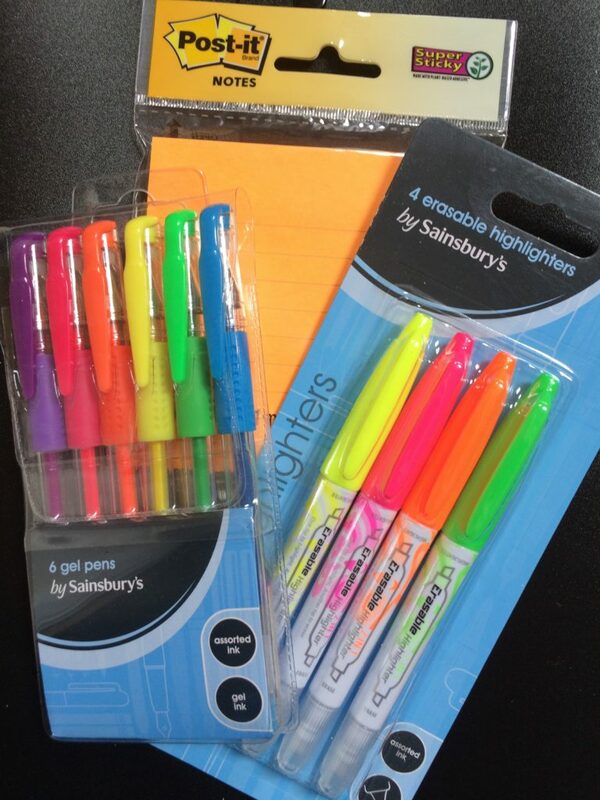 They’ve advised that the kids have highlighters and folders specifically for their revision to help them get organised.. So we’ve stocked up on stationery and cleared a space on my son’s desk. He’s been advised to do three 20 minute revision sessions on a school day and four half hour revision sessions at weekends and in half-term. He won’t be given any homework until after the exams. There is room on the revision timetable to note the days kids have extra-curricular activities – Scouts or after-school sport, as a reminder to them to manage their time effectively. It all sounds very sensible to me and he shouldn’t get overworked. I’ll be interested to see how he gets on with the revision and, most importantly, the exams. What do you think? Should schools tell children how to revise? Should children do exams in year 7? Is year 7 too early to be taking exams so seriously? One of the great joys of adult life is not having to revise any more! I think I got steadily worse at it as I got older; I took it very seriously in first year; by A levels I was spending a ridiculous portion of my revision time creating detailed and colorful revision timetables; and at uni I pulled insane allnighters cramming for the next day’s exams. I don’t miss it at all (and I’m not looking forward to having to nag my kids about theirs!). I don’t miss it all either. I was never remotely tempted to do any more studying after I’d graduated. As you can imagine, living with kids revising isn’t a whole lot of fun and we’ve not even got to proper exams yet! Oh, that’s really good. I think it’s great that they teach them how to revise. The only thing that bothers me is that everyone learns differently and less academic children might struggle with the way they’re taught to revise. I think it’s great that they teach them how to actually revise properly it must take off a lot of the pressure in fact. There are lots of years of exams ahead for him and it’s great that he has this head start. I could cry at the hours I ‘wasted’ myself on cramming and not revising properly! Thanks very much. It is great. I must have wasted an awful lot of hours too. My technique worked, but only because I spent so long on it! It’s interesting to read about the two different schools. Our experience falls in the middle – I didn’t know when the exams were but they did train the children in revision. I would be really interested in seeing the revision timetable. I’m thinking of googling printables now! I think falling in between my boys’ two schools is probably quite a good way to be! Even though they’re not asking my son to revise for long periods, I’m still feeling slightly mean that he has to do it every day. He’s decided not to make a timetable, either of his own design or using the blank template, so I’m hoping he’s keeping a proper track of what he’s studied. We had a conversation on twitter about this. It feels like he’s doing more revision than I did for my GCSEs, but then our school left us to it. I think it’s good having early technique without stressing them too much, although I expect the kids are also very focused being at Grammar school anyway. In a way I’m horrified that Y7 have formal exams, but then it does make the GCSEs a lot less stressful if they’re used to having them all the way through. Thanks very much. I think most secondary schools do end of year exams in all subjects, although it’s likely my son’s school takes them a bit more seriously than some schools! I must admit he slacked off and didn’t do any yesterday, but I’m not going to nag him about it! I think this is brilliant! Our secondary school has just begun issuing flash cards for year 9 exams and although i’m not sure that my learning-averse child will do any, I think it’s great to help them. I revised in the same way that you did. We had no advice at all and I think it was to my detriment. It’s good that your daughter is getting some support from school, even if she chooses not to take it! As I said, I remarkably did very well with my revision technique, but it really wasn’t the best way to do it! It’s good that they teach them how to revise now and set reasonable goals for how much they should do. Good too that they don’t give homework to give them time. Hope he does well. Thanks very much! He’s already getting a bit fed up of the revision, but he will be very used to it by the time he gets to year 11! I used to revise a lot like you. I’d rewrite my notes endlessly and spend a lot of time gazing out the window from being bored. How things change eh? Best of luck to him. He sounds like he has a good head on his shoulders! My son is in year 6 and had exams last week. I think the school let us know 2 weeks before but he was remarkably sanguine about the whole thing and only revised one evening for 40 mins as he was with his friend whose mother was onto them that evening. Otherwise I think he did about 10 mins a night and was off school ill for 3 days the week before so we didn’t push it. Let’s see what happens but sounds as though your Year 7 son’s school is much more organised about it than ours. It sounds like yours and your son’s attitudes were about right. Revising in primary school does seem a bit extreme! But, like you say, I don’t think a little bit of testing at this age does them any harm and it helps them to prepare for later life. I think it is a really great thing that they are getting the kids into a good routine early. It isn’t easy to revise and I know that when I was teaching, kids and parents would often ask for revision advice. I think all schools should offer support and advice as it is a crucial part of learning.